For gardeners with limited space or unsuitable growing soil, gardening in containers provides a workable alternative. Although large vegetable plants pose more of a challenge, many can be grown successfully in large pots or containers. Growing zucchini in containers typically requires a separate container for each plant. According to the University of Illinois, one or two plants provide enough fruit for the average family. The key to prolonged production is keeping young fruit picked so the plant will continue to produce more. Select a 5-gallon container or bucket for growing zucchini. A pot with straight sides is preferred--plant pots with sloping sides tip easily or overturn with strong winds. Look for a depth of 16 to 18 inches as recommended by the UC Davis Extension. Check the container for drainage holes in the bottom. Commercial pots typically have premade drainage holes, but if you are recycling an old bucket or tub, drilling holes in the bottom is necessary. Drill four to six holes 1/2 inch in diameter, evenly spaced around the bottom of the pot. Fill the pot three-quarters full with moist potting mixture. The Ohio State University Extension recommends a mixture of equal parts commercial potting soil, perlite, peat moss and compost. Garden soil or commercial potting soil compacts easily and is too heavy for container gardens. Transplant one zucchini seedling to each pot. Position the seedling to the original planting depth. Fill in around the roots with soil mixture. Firm down with your hands to secure the plant. Water thoroughly until water runs through the drainage holes in the bottom of the pot. Keep soil moist until zucchini seedlings are established and show signs of new growth. Reduce water to once a week, or whenever the soil dries at 1 inch below the surface. Container gardens dry quickly and may require daily watering during hot, dry periods. Place your zucchini plants in a sunny location that receives at least six to eight hours of direct sun a day. Fertilize with water-soluble fertilizer with a formula of 20-20-20 or 15-20-15 once a week, the Ohio State University Extension recommends. Fertilizer leaches easily through the drainage holes during watering, and container-grown plants often require more frequent fertilizing that those grown in the soil. Apply fertilizer to the soil and foliage after watering your zucchini plants to prevent damage to the plants. Harvest young zucchini when they are 6 to 8 inches long and about 1 1/2 inches in diameter. Young zucchini is thin skinned and has immature seeds, and the fruit is crisp and tender, making them suitable for stir-fries or fresh salads. Skin and seeds toughen as the zucchini matures. Monitor plants daily and keep young fruit picked. 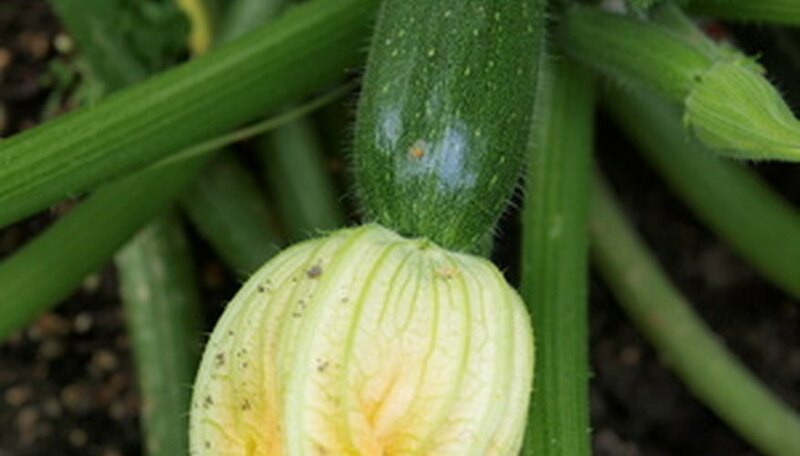 Allowing zucchini to mature on the vine slows growth and halts production of new fruit. Cut zucchini from the plant with a sharp knife. Pulling or twisting the fruit free may damage the tender stems. If using seeds, plant three to four in the container and thin to one plant per pot when the seedlings are 2 to 3 inches high. Plant zucchini after all danger of frost has passed in your area.